We’ve all been there, either you hit something while backing out, got unexpected hail damage, or you have no idea how it got there, but paint chips can be annoying and will rust if you don’t get to them fast enough. We’re going to go over what you should do, step-by-step, to repair those pesky paint chips on your car! You’ll want to start by buying a touch-up paint pen. The paint on your car doesn’t just make your car look good, it also protects your car from rusting, and if it isn’t applied properly it could make your car look even worse. However, touch up pens are designed for small chips and you’ll want to make sure you get one that matches your paint color exactly. Check the inside of your door to find the exact color of paint that your vehicle uses. Before you begin painting, you’ll want to clean the area thoroughly. This is important because you don’t want to paint over dirt. This could lead to the area getting chipped again more easily and generally not looking as good as if you’re applying to a clean surface. 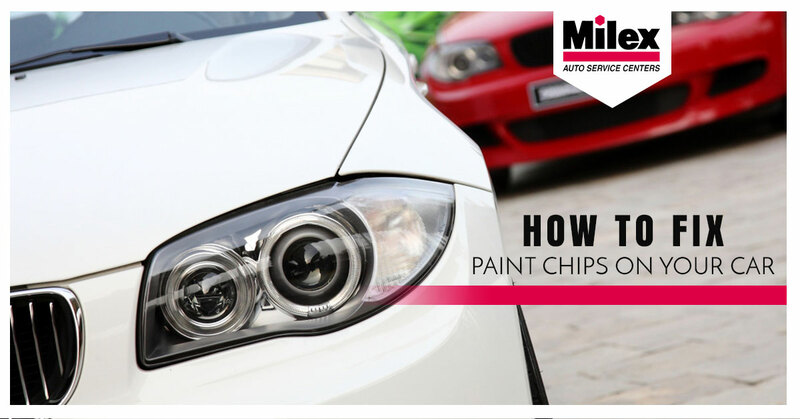 Once you’ve dried off your car, take out your paint pen and fill in the chip. This should be pretty straightforward but make sure to fill in the entire chip so there’s no chance of it peeling off after you’re done. Let the paint dry for a couple hours and then touch it to see if it’s dry. If it is, apply a fresh coat of wax and you’re all done! For more helpful tips, follow our blog or contact Milex Auto Service today to learn more about our automotive repair services in Tucson!